One of the things that loyal Indolaysia readers might not understand is that this is not a vacation, or even really a working vacation. It’s a research trip, and research (1) takes a lot of time and (2) is very tiring. This means that I don’t get to do the things that I really like to do, like exploring parts of Jakarta that I’ve never seen before or getting out to the beaches or parks in West Java. Nevertheless I took the opportunity yesterday afternoon to have a little walkabout from 3:00 until around 7:00. In all the time that we’ve been to Jakarta, neither JMP nor I have been to Pasar Baru, a market district in north-central Jakarta. So I decided to visit it. It was neat for a couple of reasons. First, it’s always fun to see a new part of town. But honestly, what was more interesting to me was the opportunity to watch people, in particular to see Indonesia’s very small Indian community. These are not expatriates, but rather Indonesian citizens born and raised here. 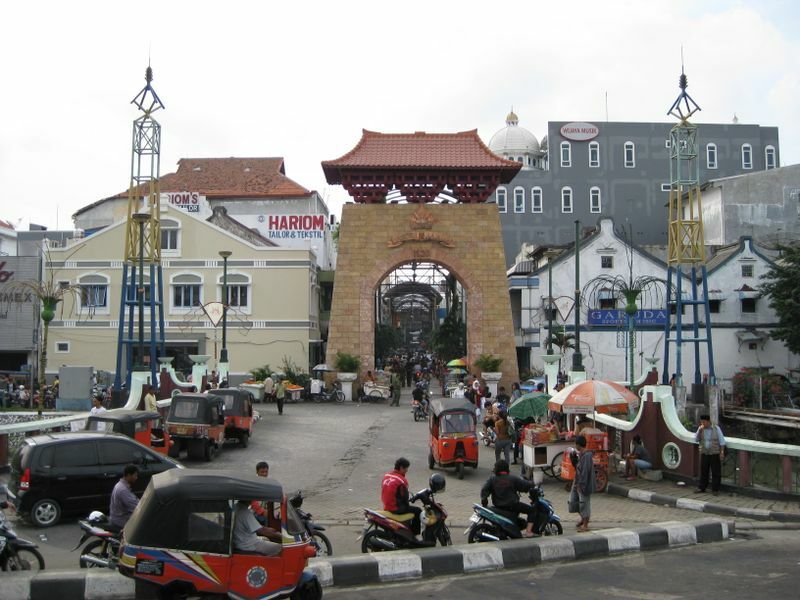 In the city of Medan, in North Sumatra, most Indians are of Tamil extraction, but in Jakarta and elsewhere on Java, they are mostly Sikhs and Punjabis. In both cities, though, Indians are associated with the textile trade. So Pasar Baru is a great place to see them. It was so nice out yesterday that I decided to walk the whole way back to my hotel, a distance of maybe a mile and a half. On the way back, I got to see the largest mosque in Southeast Asia (Mesjid Istiqlal) and right next to it a beautiful old Dutch church known as the Emmanual’s Church. After that I strolled by the American embassy. You can’t actually walk next to it because it’s so heavily fortified, but you can walk across the street from it. There was a fascinating piece of graffiti on a wall on the other side of the street that I wanted to take a picture of, so I opened my bag and dragged out my camera. But before I could open the shutters, all of the sudden a bunch of Marines with machine guns started towards me. “Sorry sir, no pictures.” They were accompanied by some of the biggest and baddest Indonesian military guys that I have seen. Even though my picture was going to be facing the other direction from the embassy. I guess they were just being careful. See more pictures of my walkabout here.